What if You Could Measure the Future? According to the United Nations “World Water Development Report 2014“, annual economic growth is estimated at about 6% in developing countries and 2% in higher income countries between 2013 and 2015. As economies grow and diversify, they experience competing demands for water to meet the needs of more municipal and industrial uses, as well as agriculture. Water availability is expected to decrease in many regions. Yet future global agricultural water consumption alone is estimated to increase by ~19% by 2050, and will be even greater in the absence of any technological progress or policy intervention (link). Understanding what impact growing populations and increased development has on existing resources is invaluable to central planning. Making the Case: Why is WERS Needed? 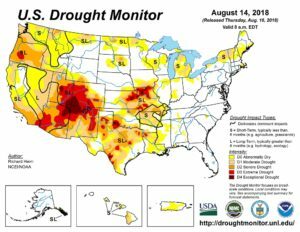 At any one point in time throughout the year, at least 30 states are in at least a D-0 level drought. We may not necessarily know where or when the next drought crisis will occur, but we can monitor its impact. At the same time, what if we could predict water use for both new and existing construction? What if we could estimate the potential impact of new construction on water treatment needs and storm water? Wouldn’t the information generated be of value to planners of municipal infrastructure? To design professionals? To potential home buyers or current home owners? The Green Builder® Coalition, in cooperation with Build Green New Mexico (BGNM), Santa Fe Area Home Builders Association (SFAHBA), and members of the City of Santa Fe Water Conservation Committee (SFWCC) have created water modeling software that generates a Water Efficiency Rating Score (WERS)®. The premise is that verified measurement and incentives will increase participation in conservation efforts. The initial goal was to integrate the WERS into the BGNM program and use it to document an empirical method of calculating eligibility for water use reduction tax credits. In February of 2014, goals were generated along with an initial action plan. In the following months, a formalized committee, consisting of representatives from BGNM, the SFWCC, the SFAHBA, The Coalition, and the Santa Fe Community College (SFCC), continued to refine the WERS program. Measurable parameters were established as the foundation of WERS, along with a scoring scale of zero to 100 with zero being the most desirable. The decided focus was on water using elements that could be measured. Initially, indoor water use was considered that involved the main plumbing fixtures of toilets, showers, lavatories, kitchen sinks, clothes washers and structural waste. Structural waste is the amount of water that is typically wasted before usable hot water arrives at the furthest hot water using fixture. The calculation for structural waste is based on the water wasted for conventional water heating systems. Much research was done to calculate the loading from the main plumbing fixtures, clothes washers and pipe priming and their eventual impact on the WERS. The program calculates indoor water use empirically, based on the estimated loading of the above items while taking into account their associated efficiencies. WERS also includes the ability to account for outdoor water use, which includes rainwater and greywater catchment calculations. Depending on the verified filtration methods for rainwater and greywater, they can be used to offset indoor water use much like solar panels can be used to offset energy use in the HERS index. Additionally, any remaining unused rainwater or greywater can be credited to potential outdoor use. Another aspect of the WERS program includes the option to require points for “Innovative Practices”. BGNM and SFWCC have both created similar lists of items as an overlay that can be incorporated into a future version of the WERS calculation process. But, because these items are either not measurable or a method of empirical data collection has not been determined yet, they are not a part of the final score. It is envisioned that communities could select a minimum point threshold of Innovative Practices that need to be accomplished as part of the WERS program. Project teams will have the ability to do initial estimates of the results of their proposed installed fixtures and appliances as well as innovative water conservation strategies without the involvement of a WERS Verifier. In order to achieve a WERS, the project team will have to send the completed program document to a qualified third-party verifier who will then check that fixtures, appliances, and strategies have been installed or implemented as claimed. Once the program document has been verified, it is then sent to The Coalition for certification processing. The certification document that is issued will then be utilized by the project team to apply for any applicable water conservation tax credits or incentives that require third-party verification. Most product manufacturers of fixtures and appliances that utilize water are already well aware of the multitude of green home building programs, as well as the EPA WaterSense program. Many have responded well by providing products that easily comply with both green homebuilding programs and the EPA WaterSense program. As the WERS continues to develop nationally and incorporates items that for now are only considered innovative practices, manufacturers may want to consider following news regarding the program. One of the best ways this can be achieved is by signing up for the Green Builder® Coalition’s communications. The program continues to be developed under the tutelage of several industry stakeholders and has already been used within the State of New Mexico. Additionally, The Coalition has worked with Santa Fe Community College to offer a training program for use of the WERS program, verification procedures, and certification. In 2015, WERS won an award from the Sustainable Santa Fe Commission. From the start of 2015 through July 2018, WERS sessions have been presented at the following national or regional conferences: Home Performance Coalition (4x), StormCon, Passive House, EEBA (2x), ARCSA, AWRA, ABX, WaterSmart Innovations (2x), NGWA, IA, 2016 Land & Water Summit, AWWA ACE (2x), SWMC and Florida Section’s Conference, New Mexico Housing Summit, Home Performance Conference (Portland), Localizing California Waters, WaterCon, MEEA’s Annual Codes Conference, the National Energy Codes Conference, the Getting to Zero National Forum and Energy Out West. The City of Santa Fe, NM passing an ordinance that incorporates the WERS program into their residential green building code. As of March 1, 2017, a WERS of 70 or less is now required for all new single family projects. The NM state legislature extended their very popular sustainable building tax credit. When they did, they added a water conservation requirement. WERS was cited in the tax credit’s rules as a way to determine the degree of water conservation. GreenStar, an upper Midwest green building program, has decided to utilize the WERS program as the water component of their overall program. We have an agreement with ARCSA to partner on education, training and promotion. In early March 2016, the first WERS training course was held in Santa Fe, NM, and 10 students passed both the written and field exams. Three other courses have been held since March 2016. Three manufacturers have partnered with WERS to offer discounts on water-efficient products: Evolve Technologies, EcoVie and Flow-Know®. We are always looking for additional partners. This is our way of trying to increase the ROI of water efficiency beyond the water bill savings. In January 2017, WERS was granted a service mark from the USPTO. The 2nd annual Next Generation Water Summit was held on April 30 – May 2, 2018. This unique, 3-day event brings together the building community, policy makers and land use planners to network and discuss applicable water efficiency initiatives. A portion of the WERS calculation was able to assist a single-family project in Minnesota obtain LEED for Homes Platinum and GreenStar Gold. Triconic, UL and Intertek have entered into an agreement with the Green Builder® Coalition to expand WERS beyond New Mexico to all U.S. states and potentially other countries. RayLee Homes became the first large-scale homebuilder in the U.S. to commit to submitting all new homes through the WERS certification process. On August 14, 2018, the Santa Barbara (CA) City Council adopted an ordinance that would enable WERS to administer code compliance of ultra-high water use efficiency multifamily projects. The Green Builder® Coalition is a not-for-profit association dedicated to amplifying the voice of green builders and professionals to drive advocacy, information and education for more sustainable home building practices. We are an action-oriented community of green builders and professionals dedicated to uniting and growing our joint expertise, values and voice to create stronger standards for sustainable, more environmentally responsible home building. For more information, visit www.greenbuildercoalition.org. Build Green NM is an education and certification program for building High Performance Homes across the State of New Mexico. High performance means added comfort, lower utility bills and healthier indoor air quality to name a few of the key features. We don’t build great homes; we certify them from experienced builders across the state. Added in 2015 is a complementary program regarding efficiency upgrades to existing homes. For more information, please visit www.BuildGreenNM.com. As a local Home Builders Association in one of America’s most progressive and green-focused communities, SFAHBA proudly reflects its local demographic and constantly pushes the envelope in re-imagining the built environment. With national lab scientists, world-renowned artists, and indigenous cultures going back centuries and millennia, Santa Fe builders have many sources of inspiration to draw upon. Their creative thinking on water, energy, and resource efficiency finds its way into the unique homes that embody “Santa Fe Style”. For more information, visit www.sfahba.com. The EnergySmart Academy at Santa Fe Community College is a nationally recognized training center specializing in energy efficiency, green building and sustainable technology trainings. As well as offering Interstate Renewable Energy Council (IREC) accredited clean energy programs, Building Performance Institute (BPI) and RESNET trainings, staff have been involved in the development of the WERS protocol and offered the inaugural WERS Verifier training course. For more, visit www.energysmartacademy.com.